The first full week of the MiLB season is in the books and the different leagues are handling out the first round of player and pitcher of the week accolades. The Oakland Athletics pitching prospects took home Pitcher of the Week awards in three different leagues. Coming into the season the A’s had the 7th ranked Top Farm system by MLB Pipeline. The pitching prospects are led by A.J. Puk and Jesus Luzardo. However, Puk went under the knife to have Tommy John Surgery last week and Luzardo has had a very strong showing in his first two starts of the season. California League, Pitcher of the Week: Parker Dunshee, Stockton Ports. Dunshee had 2 starts and only gave up 3 hits while striking out 14 batters. He won his second start at San Jose on April 12th and has yet to give up a run. Midwest League, Pitcher of the Week: Bryce Conley, Beloit Snappers. Conley has tossed 10 scoreless and hitless innings to start the 2018 season. Conley tossed the first 6 innings of Beloit’s combined no hitter with Ty Damron and Josh Reagan finishing it off. Pacific Coast League, Pitcher of the Week: James Naile, Nashville Sounds. Naile went 3-0 and has pitched 17 2/3 scoreless innings in 3 starts to begin the 2018 season. Naile has allowed 15 hits, only 2 walks and stuck out 15 batters. This is just the tip of the iceberg for Oakland’s pitching prospects. The Stockton Ports starting pitching combined for 39.2 IP, 21 H, 2 ER, 9 BB, 59 K in the first 8 games. Bobby Wahl, Jeremy Bliech and Lou Trivino have each pitched in 3 games out of the bullpen for Nashville and have not given up a run. Jake Sachez, currently with Midland, has not given up a run in 3.1 IP with Midland and Nashville combined. As I prepare for my first trip in 2018 to John Thurman Field, home of the Modesto Nuts. I can’t help, but think back to my last trip there in 2017. It was Friday, September 15th, Game 3 of the California League Championship. The Nuts would roll to an 8-1 victory over the Lancaster JetHawks, securing Modesto’s first title since 2004 when they were an affiliate of the Oakland Athletics. As a life-long baseball fan, there are certain milestone events I have always wanted to witness in person. One of which is a team winning their league championship. I was fortunate enough to be among the 3,329 fans in attendance that night. This win completed the “perfect postseason” where the Modesto Nuts beat the Stockton Ports in the first round 3 games to 0 and the Lancaster JetHawks in the finals 3 games to 0. 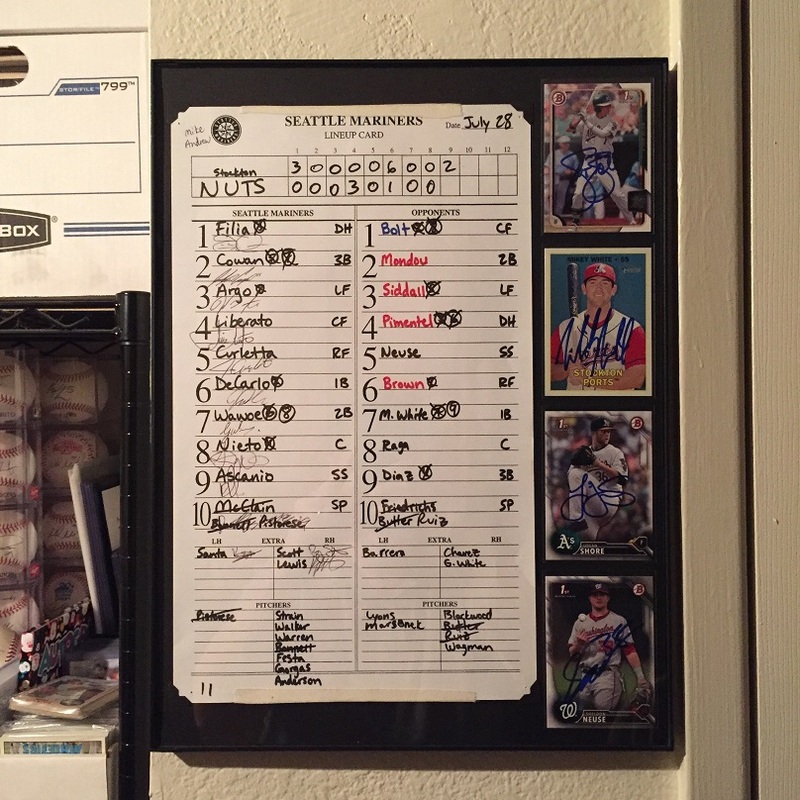 This was the Nuts first season as a Seattle Mariners affiliate. Joe Rizzo, who was promoted to Modesto during the final week of the season, was named Cal League Finals MVP after hitting 7 for 13 (.538) with 1 HR and 4 RBI. The then 19-year old was drafted in the 2nd round of the 2016 draft out of Oakton in Vienna, VA. Kyle Lewis also had a strong series batting 6 for 14 (.429) with a 2B, 3B and 2 RBI. Lewis was the Mariners first round draft pick in 2016 out of Mercer College. Modesto Nuts celebrates their first Cal League Championship. After the game I was fortunate enough to get a couple of autographs from the newly crowned champions. First was a Cal League Baseball signed by Kyle Lewis. Lewis was nice enough to inscribe 2017 Champs on the ball. I was also able to get the Cal League Finals MVP, Joe Rizzo, on a Cal League Ball. Rizzo inscribed Cal League Final MVP on the ball for me. Joe Rizzo being announced as the Cal League Finals MVP. All-in-all this was a great night to witness history. I am excited to have these 2 pieces of autographed memorabilia to remember that night. A few months ago, I picked up my oldest baseball card. 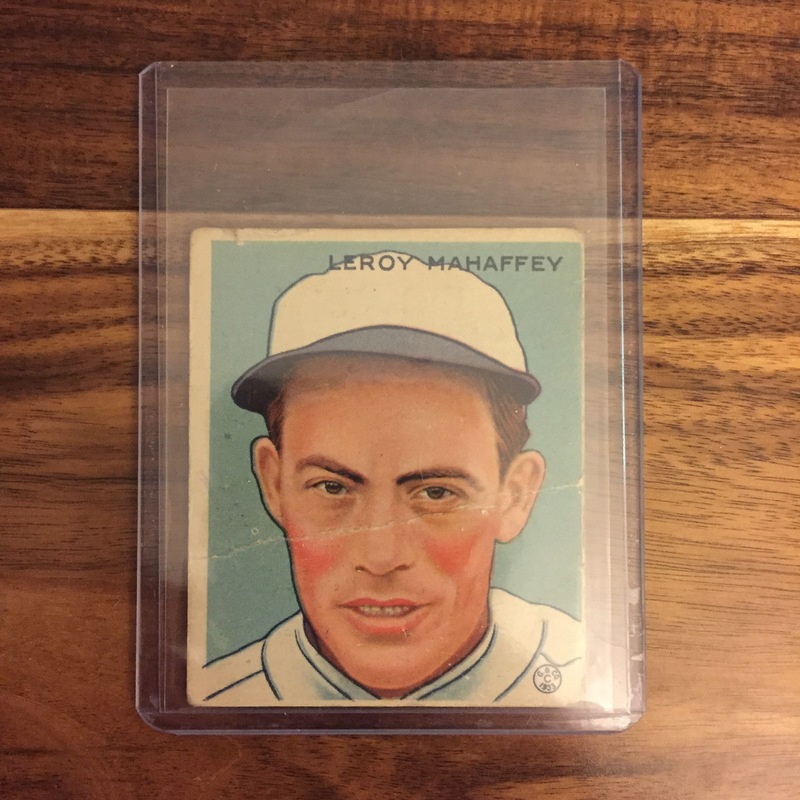 It is a 1933 Goudey of Leroy Mahaffey, pitcher for the Philadelphia Athletics. This is a genuine card. There are many reprints available for cards from this era, including some really convincing “aged” reprints. It is unfortunate that there is a crease across the middle, but cards from this era can be quite expensive in better condition. I knew this going into the purchase and the card was priced accordingly. Mahaffey pitched for the Philadelphia Athletics from 1930-35. He compiled a 64-43 record with a 4.82 ERA. He also pitched for the Pittsburgh Pirates in 1926-27 and the St. Louis Browns in 1936. One interesting story about Mahaffey involves New York Yankees slugger Babe Ruth. On June 7, 1930 Mahaffey got the start against the Yankees. During the previous six games, Ruth hit eight home runs. On that day Mahaffey struck out Ruth four times. Mahaffey never gave up a home run to the legendary slugger in fourteen appearances against the Yankees.